Ottomans annex for the first time Eastern Anatolia and parts of Mesopotamia from the Safavids, as well as briefly what is modern-day northwestern Iran. The Battle of Chaldiran (Persian: جنگ چالدران‎‎; Turkish: Çaldıran Muharebesi) took place on 23 August 1514 and ended with a decisive victory for the Ottoman Empire over the Safavid Empire. As a result, the Ottomans annexed eastern Anatolia and northern Iraq from Safavid Iran for the first time. It marked the first Ottoman expansion into eastern Anatolia, and the halt of the Safavid expansion to the west. Despite the Iranians briefly reconquering the area over the course of the centuries, the battle marked the first event that would eventually, through many wars and treaties later, lead to its permanent conquest, until the dissolution of the Ottoman Empire centuries later. By the Chaldiran war the Ottomans also gained temporary control of northwestern Iran. The battle, however, was just the beginning of 41 years of destructive war, which only ended in 1555 with the Treaty of Amasya. Though Mesopotamia and Eastern Anatolia (Western Armenia) were eventually taken back by the Safavids under the reign of king Abbas I (r. 1588–1629), they would be permanently lost to the Ottomans by the 1639 Treaty of Zuhab. At Chaldiran, the Ottomans had a larger, better equipped army numbering 60,000 to 100,000, while the Qizilbash Turcomans numbered some 40,000 to 80,000. Ismail I, was wounded and almost captured during the battle. His wives were captured by Selim I, with at least one married off to one of Selim's statesmen. Ismail retired to his palace and withdrew from government administration after this defeat and never again participated in a military campaign. The battle is one of major historical importance because it not only negated the idea that the Murshid of the Shia-Qizilbash was infallible, but it also fully defined the Ottoman-Safavid borders with the Ottomans gaining northwestern Iran, and led Kurdish chiefs to assert their authority and switch their allegiance from the Safavids to the Ottomans. After Selim I's successful struggle against his brothers for the throne of the Ottoman Empire, he was free to turn his attention to the internal unrest he believed was stirred up by the Shia Qizilbash, who had sided with other members of the Dynasty against him and had been semi-officially supported by Bayezid II. Selim now feared that they would incite the population against his rule in favor of Shah Isma'il leader of the Shia Safavids, believed by some of his supporters to be descended from the Prophet. Selim secured a jurist opinion that described Isma'il and the Qizilbash as "unbelievers and heretics" enabling him to undertake extreme measures on his way eastward to pacify the country. In response, Shah Isma'il accused Sultan Selim of aggression against fellow Muslims, violating religious sexual rules and shedding innocent blood. When Selim started his march east, the Safavids were invaded in the east by the Uzbeks. The Uzbek state had been recently brought to prominence by Abu 'I-Fath Muhammad, who had fallen in battle against Isma'il only a few years before. Attempting to avoid having to fight a war on two fronts, Isma'il employed a scorched earth policy against Selim in the west. 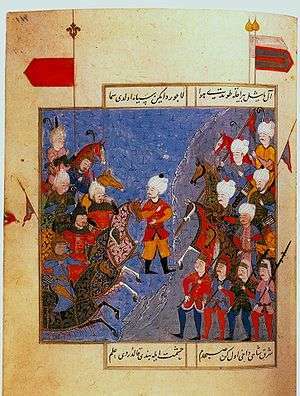 Selim's army was discontented by the difficulty in supplying the army in light of Isma'il's scorched earth campaign, the extremely rough terrain of the Armenian Highland and the fact that they were marching against Muslims. The Janissaries even fired their muskets at the Sultan's tent in protest at one point. When Selim learned of the Safavid army forming at Chaldiran he quickly moved to engage Isma'il, in part to stifle the discontent of his army. The Ottomans deployed heavy artillery and thousands of Janissaries equipped with gunpowder weapons behind a barrier of carts. The Safavids used cavalry to engage the Ottoman forces. The Safavids attacked the Ottoman wings in an effort to avoid the Ottoman artillery positioned at the center. However, the Ottoman artillery was highly maneuverable and the Safavids suffered disastrous losses. The advanced Ottoman weaponry was the deciding factor of the battle as the Safavid forces, who only had traditional weaponry, were decimated. The Safavids also suffered from poor planning and ill-disciplined troops unlike the Ottomans. Following their victory the Ottomans captured the Safavid capital city of Tabriz on 7 September, which they first pillaged and then evacuated. Selim was however unable to press on after Tabriz due to the discontent amongst the Janissaries. The Ottoman Empire successfully annexed Eastern Anatolia (encompassing Western Armenia) and northern Mesopotamia from the Safavids. These areas changed hands several times over the following decades however; the Ottoman hold would not be set until the 1555 Peace of Amasya following the Ottoman-Safavid War (1532–1555). Effective governmental rule and eyalets would not be established over these regions until the 1639 Treaty of Zuhab. As a result of the Chaldiran battle the Ottomans also gained brief control over northwestern Iran. The Shia defeat at Chaldiran brought an end to the Shia uprisings in the Ottoman Empire. After two of his wives and entire harem were captured by Selim Ismail was heartbroken and resorted to drinking alcohol. His aura of invincibility shattered, Ismail ceased participating in government and military affairs, due to what seems to have been the collapse of his confidence. After the defeat at Chaldiran, however, the Safavids made drastic domestic changes. From then on, firearms were made an integral part of the Persian armies and Ismail's son, Tahmasp I, deployed cannons in subsequent battles. After the victorious battle of Chaldiran, Selim I next threw his forces southward to fight the Mamluk Sultanate in the Ottoman–Mamluk War (1516–1517). The site of the battle is near Chala Ashaqi village, around 6 km west of the town of Siyah Cheshmeh, south of Maku, north of Qareh Ziyaeddin. A large brick dome was built at the battlefield site in 2003 along with a statue of Seyid Sadraddin, one of the main Safavid commanders. Always drunk to the point of losing his mind and totally neglectful of the affairs of the state. ↑ Morgan, David O. The New Cambridge History of Islam Volume 3. The Eastern Islamic World, Eleventh to Eighteenth Centuries. Cambridge: Cambridge U, 2010. p.210 "Although the Safavids experienced military defeat at Chāldirān, the political outcome of the battle was a stalemate between the Ottomans and Safavids, even though the Ottomans ultimately won some territory from the Safavids. The stalemate was largely due to the ‘scorched earth’ strategy that the Safavids employed, making it impossible for the Ottomans to remain in the region"
↑ Ágoston, Gábor (2014). "Firearms and Military Adaptation: The Ottomans and the European Military Revolution, 1450–1800". Journal of World History. 25: 110. 1 2 Kenneth Chase, Firearms: A Global History to 1700, 120. 1 2 3 4 5 6 Mikaberidze 2015, p. 242. ↑ Caroline Finkel, Osman's Dream, (Basic Books, 2006), 104. .
↑ Caroline Finkel, Osman's Dream, 105. ↑ Caroline Finkel, Osman's Dream, 106. ↑ Andrew James McGregor, A Military History of Modern Egypt: From the Ottoman Conquest to the Ramadan War, (Greenwood Publishing, 2006), 17. ↑ Gene Ralph Garthwaite, The Persians, (Blackwell Publishing, 2005), 164. ↑ The Cambridge history of Iran, ed. William Bayne Fisher, Peter Jackson, Laurence Lockhart, pg. 224. ↑ The Cambridge History of Islam, Part 1, By Peter Malcolm Holt, Ann K. S. Lambton, Bernard Lewis, p. 401. ↑ "Safavid Persia:The History and Politics of an Islamic Empire". Retrieved 26 May 2014. Wikimedia Commons has media related to Battle of Chaldiran.